Cream cheese is categorized as a fresh cheese since it is unaged. As a result, it has a short shelf life, once opened. The flavor is mild, fresh-tasting, and sweet, yet has a pleasing slight tang. 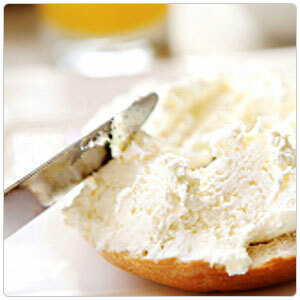 At room temperature, cream cheese spreads easily and has a smooth and creamy texture. Pack size: Produce Express offers cream cheese from Clover Sonoma in a 3# block, wrapped in foil packs. Cream cheese is often combined with other ingredients like herbs, spices, nuts, and salmon, then spread on crackers or flatbreads. Smoked salmon, capers, red onion and cream cheese on a toasted bagel is a must. Cream cheese is the main ingredient in cheesecake and it also makes a wonderful frosting for cakes, cupcakes, and cookies. Cream cheese is an American invention developed in 1872 in New York state. A cheese distributor soon commissioned the enterprising dairyman to produce the cream cheese in volume under the trade name "Philadelphia Brand®." The company was eventually bought out by Kraft Foods in 1928, and still remains the most widely-recognized brand of cream cheese in the United States. Produce Express offers cream cheese from Clover Sonoma. The Clover dairy brand began in the early 1900's when the Petaluma Cooperative Creamery began distribution in Sonoma and Marin counties. A large fire destroyed the Petaluma plant in 1975 and the company re-emerged as Clover Stornetta in 1977 and opened a new state-of-the-art facility in 1991 and has steadily increased distribution throughout California. In 2017, Clover Stornetta was rebranded as Clover Sonoma, paying homage to the region that is home to many of their family ran farms.